The Humane Gardener fills a unique niche in describing simple principles for both attracting wildlife and peacefully resolving conflicts with all the creatures that share our world. Detailed chapters address planting for wildlife with native species; providing habitats that shelter baby animals, as well as birds, bees, and butterflies; creating safe zones in the garden; cohabiting with creatures often regarded as pests; letting nature be your garden designer. 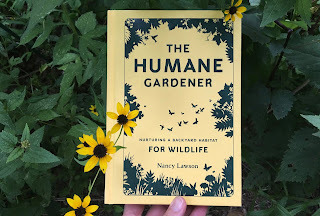 In her presentation Nurturing Habitat for Wildlife, author Nancy Lawson will expand on the message in her book and address practical ways to put humane gardening philosophies into action. Why do we call some insects “beneficial” while others are “pests”? Why are some plants considered “desirable” while others are “weeds”? In this myth-busting talk, learn how common growing methods divide the natural world into false dichotomies and perpetuate misperceptions about the wild species living among us. 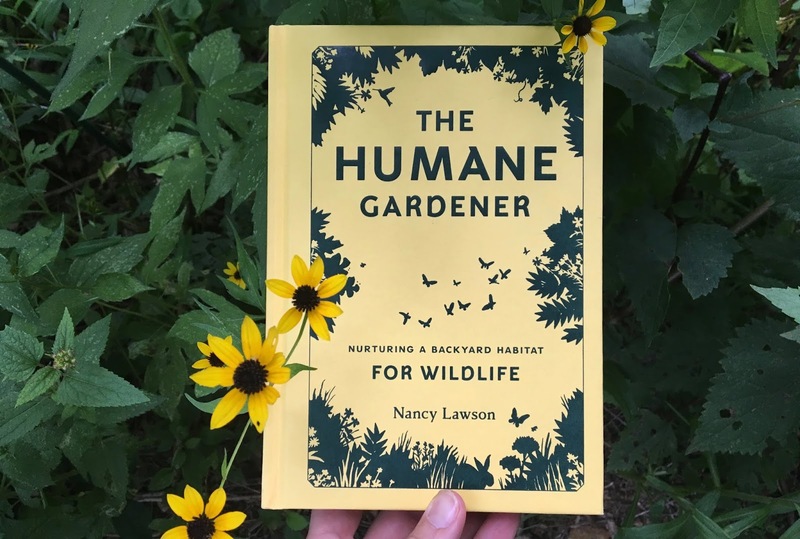 Nancy Lawson is the author of The Humane Gardener: Nurturing a Backyard Habitat for Wildlife and a columnist for All Animals magazine. A frequent speaker on garden ecology, she founded Humane Gardener, an outreach initiative dedicated to animal-friendly landscaping methods. Lawson's book and wildlife habitat have been featured in The New York Times, The Washington Post, and Oprah Magazine. She previously led the creative teams behind the award-winning magazines of The Humane Society of the United States. Certified as a Chesapeake Bay Landscape Professional, she also volunteers as a master gardener and master naturalist in central Maryland. Taking the wild into the landscape can be a wonderful gardening experience, or a maintenance nightmare. This is not selective to native plant material, we often find this in plant material sourced outside of one’s region. The difference is the non-natives can become more than just weeds in our garden, they become invasive species. There are some things you can think about when you design your tidy native garden. Consider the plant’s native environment and habitat, and the level of maintenance you are willing to do. The list of well-behaved natives is much longer than one would assume. While designing your native garden consider the growing conditions. Some plants placed in conditions different from their native environment will take on a different growth habit. For instance, anemone (Anemone spp.) often found in the shade, forms nice clusters and doesn’t spread in a carpet form, but in full sun, watch out. In its natural environment, cup plant (Silphium perfoliatum) has competition from many prairie grasses and other strong full sun forbs and will form colonies. If you plant it in a landscape bed with low competition and little maintenance, it will take over. Bee balm (Monarda fistulosa), for example, will do the same thing in your garden as it does along the road sides. Like all natives, these can have a place. By looking at how plants grow in nature, a gardener can learn how they may act in their own landscape. In designing a smaller native garden, consider the amount of maintenance you are willing to do. Almost any native can be controlled by deadheading and digging up excess plants. I often find mass plantings of individual species easier to maintain. With mass plantings any other plant that joins the crowd should be moved. Remember, a weed is nothing more than an unwanted plant. If hyssop (Agastache foeniculum) jumps in with blazing star (Liatris spp.) and it’s unwanted there, it is a weed. Transplant it to another location, or give it to a friend. Plant material decisions become more obvious when considering the amount of maintenance you are willing to do. Shrubs in the right locations are great low maintenance plants. In this article I will focus on herbaceous material. Consider a well-behaved milkweed (Asclepias spp. 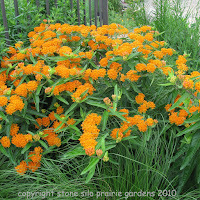 ), like orange milkweed (Asclepias tuberosa). Most of us think of the fairly aggressive common milkweed (Asaclepias syriaca), but orange milkweed, often called butterfly weed, can be very well-behaved. 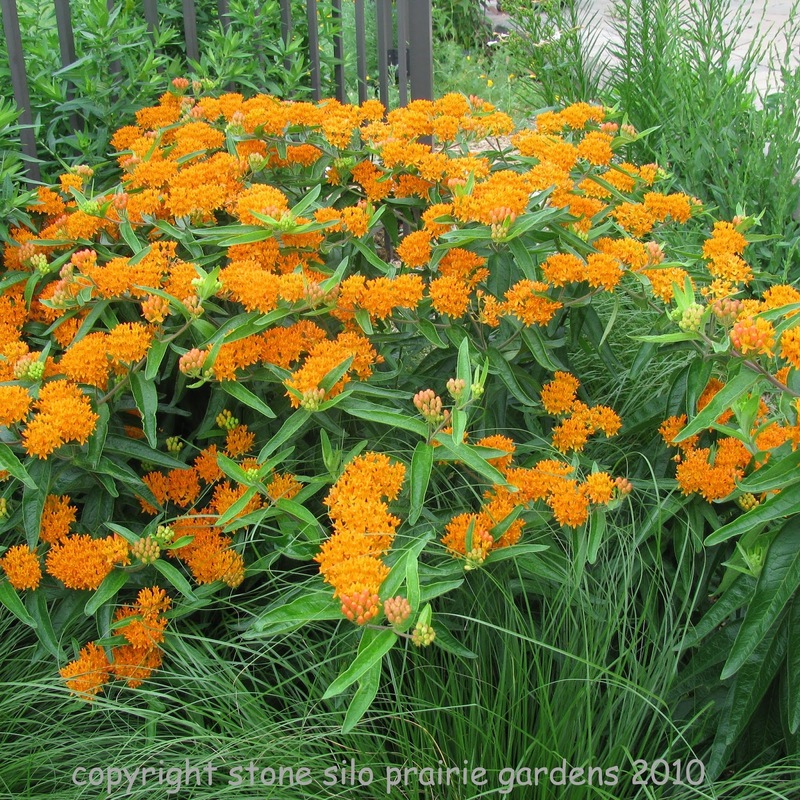 Asclepias tuberosa is a great stout, long blooming, and very attractive native perennial. This show stopper emerges from the ground late but makes a quick appearance once up. Its lovely striking orange blossoms attract all sorts of pollinators. The milkweed family is also a food source for the larvae stage of the Monarch butterfly. It’s a long-lived perennial that makes a great landscape plant, but may take a few years to mature. Blue false indigo (Baptisia australis) is a shrub-like perennial that blooms in the spring. Other baptisias come in various colors and forms. Some of them can become quite large over time. They are easy to control by removing the seed heads in fall or by digging their babies. During the winter, the seed heads are great hotels for dormant insects, which are bird food! Blue false indigo will emerge in spring looking similar to asparagus. Then it forms a nice shrub-like plant that has a bean or pea-type leaf. Since they are legumes, the plants improve the soil and have a very large root system. Plants bloom for a few weeks, then remain as a nice texture plant throughout the season and into the winter, with seed heads forming in June. Short compact plants are often nice for borders or along walkways. 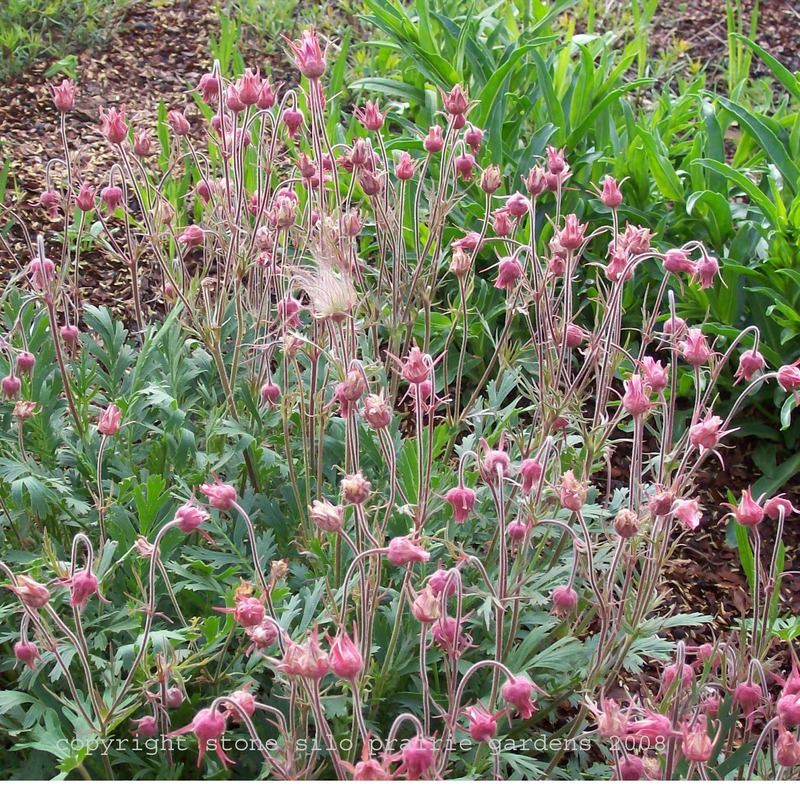 Prairie smoke (Geum triflorum) is a well-behaved option, blooming in the spring with a flower that resembles smoke. The foliage often remains evergreen throughout the winter, carrying a feathery texture. 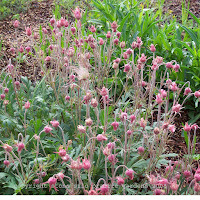 Prairie smoke spreads slowly out from its base. Clump forming grasses serve many functions in the garden. They create habitat for wildlife and provide food sources. Their strong roots compete in the soil with weeds, offer erosion control, and wonderful seasonal interest. Some grasses grow from rhizomes; these aren’t recommended in small areas. A rhizome is one continuous root, and grasses like sweet grass (Hierochloe odorata) will proliferate. Turf grass is a good example of a plant that spreads by rhizome. Clump forming grasses such as little bluestem (Schizachyrium scoparium) are much more well-behaved. They will spread by seed but are easy to dig when young or can be let go to fill in. Little Blue is a great landscape plant in masses or small clusters, with an absolutely striking fall color. In the shade many of our spring ephemerals spread readily but go dormant for much of the season. Plants like Virginia bluebells (Mertensia virginica) compete very little with later emerging plants. Blue bottle gentian (Gentian andrewsii), if planted in its desired location, may spread by seed, but will be welcomed. In conclusion, property owners don’t need acres of land to grow native plants for wildlife habitat. Many beneficial native plants can be used in the typical city lot. Once established, native plantings can function very well in the landscape. Allow desired plants to form dense colonies, in turn keeping out unwanted plants. Sedges such as Pennsylvania sedge (Carex pensyvanica) can form a natural green mulch, reducing the need to purchase mulch. A native plant in the right place won’t require watering once established. Even in the dog days of summer they will maintain their beauty without irrigation. Native plants are adapted to most garden pests and can withstand some damage, eliminating the need for pesticides. Also, chewed leaves of plants are a sign of a healthy garden that is supporting insect life, aka bird food. Check with your local nurseries to see if they sell plants native to your area. If they don’t, encourage them to do so. Stone Silo Prairie Gardens is located in Ledgeview, Wisconsin. Stop and see our wide variety of native plants. In 2012, Wild Ones, with the help of many community members and groups, worked with the Green Bay City Council to pass an ordinance friendly to native plants and natural landscaping. Now, city residents can design and plant their landscapes without fear of them being cut down as "weeds."